Today I want to write about an amazing looking reptile, the rhinoceros chameleon. 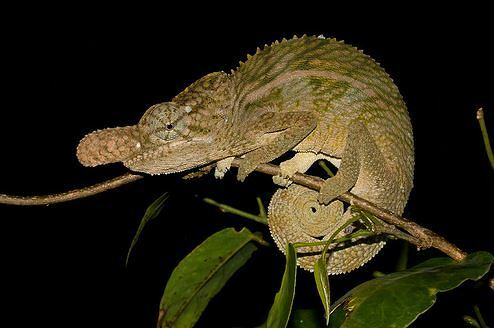 These strange looking chameleons grow up to 27 cm long, with the males growing twice as big as the females. The horns that give them their name are bigger in the males and they use them to fight with each other. They spend most of their time in trees where they catch insects using their long tongues. At breeding time, the females lay 4-11 eggs, which take almost a year to hatch. Rhinoceros chameleons are found in forests on the island of Madagascar and are considered vulnerable to extinction due to habitat loss. Are there any other interesting facts that you would like to share about rhinoceros chameleons?